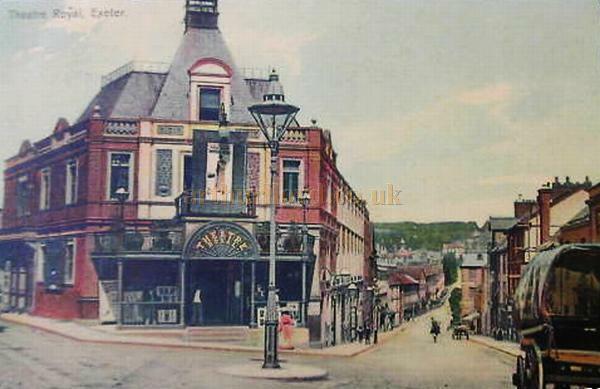 The Exeter Theatre was first opened on the 30th of December 1734. An article (Shown Right) in the the Daily Journal of the 15th of January 1735 reports on the opening address made by Mr. Kennedy to inaugurate the opening of the Theatre. The Exeter Theatre had been a successful house for many years and some of the greatest actors of the time had performed there, including Edmund Keane who was in 'The Merchant of Venice' there in 1811. 'Destruction of our Theatre by Fire. Yesterday Morning, between the hours of two and three o'clock, our Theatre was discovered to be on fire, an alarm was soon spread through the city, and several fire-engines were, as speedily as possible, drawn to the spot; but before their arrival the flames had burst through the roof, which shortly after fell in with a tremendous crash. The interior of the building, at this time, presented one entire blaze from end to end, preventing the possibility of saving a single article; and in little more than and hour, from the first discovery of the fire, the whole of the building was enveloped in one mass of ruins. The flames raged with amazing fury, and the sight was awfully grand and appalling. Large flakes of fire were constantly ascending, which, drifted by the wind, excited the utmost terror and alarm through the neighbourhood. Four or five houses in Southernhay Place, situated near the Theatre, were in the most imminent danger; to the preservation of those the engines were principally directed, and by the indefatigable efforts of the fire-men, and others who assisted, they were fortunately saved, as well as the handsome building in front of the Theatre, lately erected. The Theatre had been elegantly fitted up, at a considerable expense, previous to the opening this season; The loss to the Proprietors must be very considerable, as, we understand, the property is not insured to one half of its amount. The state of the Performers is deeply to be lamented, they have recently suffered a loss of several weeks salary, in consequence of the deaths of the Duke of Kent and the King, and now, by this dreadful visitation, which has deprived them of their dresses and other properties, many of them may be said to have lost their all. The above text in quotes was first published in Trewmans Exeter Flying Post, 9th of March 1820. 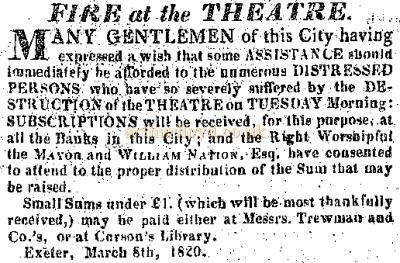 Left - The advertisement printed in Trewmans Exeter Flying Post which accompanied the report of the Exeter Theatre being destroyed by fire on the 8th of March 1820. The last manager at the Exeter Theatre is reported to have been Richard Hughes, who had the New Theatre in Bedford Street built to replace the Exeter Theatre which was destroyed by the fire on the 8th of March 1820. During this period Waterbeer Street was renamed Theatre Lane. 'The, north door, under colonade, is the entrance to the Boxes, and from thence to the Lobby for servants, at the end of which is the pay and cheque place for each Circle of Boxes between are folding-doors, covered with scarlet Moreen, with glass panel, these open into a Coffee-Room; adjoining is a room for Ladies shawls, cloaks, &c. with every convenience attached: from the Coffee-Room are folding-doors, similar to the others, communicating with the Corridor and the Lower Circle of Boxes, which are very spacious. The Second Circle of Boxes have a separate entrance by a flight of steps ascending from the pay place into a Coffee-Room, from thence through the Lobby to the Boxes, which are equally spacious. 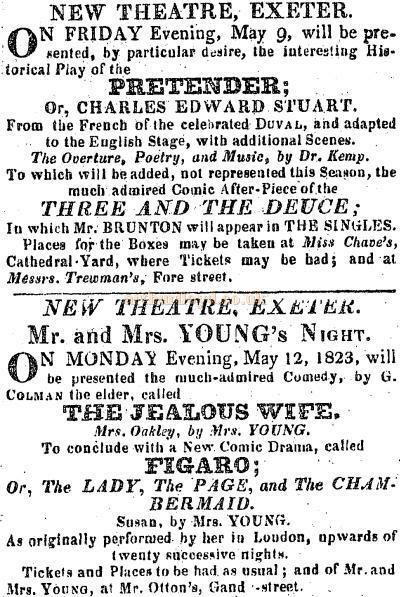 Right - A cutting from Trewmans Exeter Post of the 8th of May 1823 advertising forthcoming productions at the New Theatre, Exeter. From the Second Circle are two staircases for the Side Boxes of the Upper Circle. The Gallery is spacious, and the Pit well elevated, with good entrances, and folding-doors. - The plan, or area of the audience part of the Theatre, forms about two-thirds of the circle, with the ends rounded, which gives a graceful appearance. The fronts of the Boxes are elegantly ornamented with gold and silver, in basso relief, and formed into panels by gold mouldings;  the Lower Circle has a large Laurel Wreath, supported by the head of Bacchus on each side:  the Second Circle bears the National Emblems of the Oak, Rose, Thistle, and Shamrock, tastefully grouped., the Third Circle a Grecian Foliage Scroll, with the head of Momus. The different Boxes are supported by silvered columns. The Ceiling forms an Eliptical Dome, spandril'd over the Gallery, and richly ornamented with Mercury's Cedusas, springing from each column, and divided into pelmets, with silver ornaments; the Cornice, under the Ceiling, is ornamented with a running Laurel Leaf, in gold and white, with Silver Stars above. In the centre of the Ceiling is a Circular Dome, enriched with the Oak, Laurel, and Rose, terminating with a large Silver Star, so contrived as to regulate the temperature and ventilate the house. The Proscenium is formed by four square Marble Columns, with gold caps and bases, supporting an elegant Entablature, from which, springs a Segment Arch, cove panneled with silver ornaments; in the Spandril, under the Arch, is the National Union Arms, in gold. The Stage Doors are panneled with a Grecian frett; and the fronts of the Stage Balconies are ornamented by a beautiful group, representing the birth of Momus; above is a Canopy, over which are emblematical figures of History, Poetry, &c. The front of the Boxes is a pink and Stone colour, the back a deep crimson  the whole producing a warm and beautiful effect. The House is lighted by an elegant Grecian bronzed Chandelier, with twenty-four Lamps in its circumference, and relieved by painted Glass  representing the nine Muses, Britannia, Caledonia, and Hibernia, with a running bond of the Rose, Thistle, and Shamrock, and the bead of Apollo in the centre;  from each column is supported, on a silver bracket, a beautiful bronzed Grecian Vase Lamp, with a ground Globe Glass over the light of each, as well as that of the Chandelier, which distributes a beautiful soft light over the whole house and producing, all together, an elegant classical effect. The above text in quotes is an extract from an article first published in Trewmans Exeter Post, 11th of January 1821. Arthur Lloyd's father, Horatio Lloyd began his acting career in Exeter, according to his autobiography, when he was 14 which would have been in 1821. The most probable Theatre would have been the New Theatre the year after it opened. Horatio notes this occasion here. 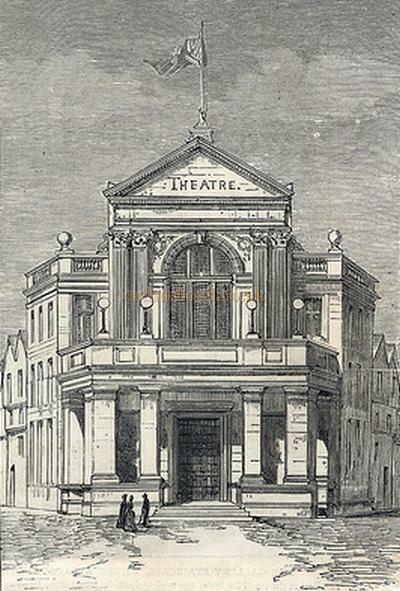 The New Theatre was renamed the Theatre Royal in the 1830s and ran as such for some 50 years before being destroyed by fire whilst under the leseeship of Mr. F. Neebe on the 7th of February 1885. The Theatre had been occupied by Frank Emery's Bath pantomime Company the previous evening with a production of 'Beauty and the Beast' but a fire was discovered in the Theatre at about 4am the following morning and before long it had taken such hold that it was almost completely destroyed. 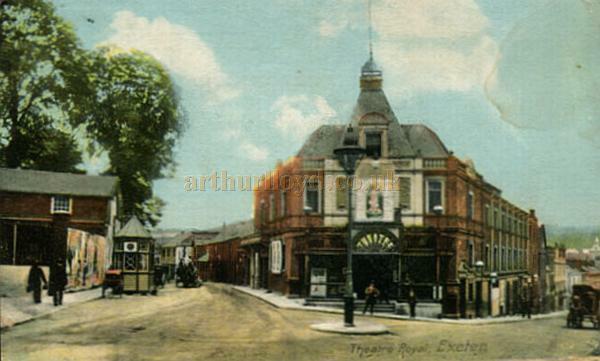 The land was subsequently used for the erection of a drill hall for the Exeter Rifles and a new Theatre Royal was built to replace the destroyed building on a new site at the corner of Longbrook Street and New North Road. More on this Theatre below. Arthur Lloyd is known to have performed in Exeter in 1871, probably at this Theatre Royal. The second Theatre Royal was built on the corner of Longbrook Street and New North Road, Exeter and was designed by the well known Theatre Architect, C. J. Phipps and built to replace the earlier Theatre Royal, formerly the New Theatre, which had been destroyed by fire on the 7th of February 1885. The foundation stone for the new Theatre Royal was laid on the Wednesday afternoon of the 12th of May 1886 and the ERA reported the occasion in their 15th of May edition saying: 'A most interesting ceremony was performed at Exeter on Wednesday afternoon, when the Right Worshipful the Mayor of the ancient and loyal city laid in state the corner stone of the New Theatre Royal. The greatest interest was shown in the event, and in the vicinity of the site of the new building there was a display of flags, and shortly after noon, although the weather was rather unfavourable, a large assemblage of persons had gathered to witness the stone laying and to do honour to the Mayor (R. R. M. Daw, Esq. ), who, accompanied by the sergeants-at-mace, the town clerk, several of the city justices, aldermen, and councillors, was received with loud and prolonged cheering. The old theatre, of which Mr F. Neebe was the lessee, for many years stood in Bedford-circus, and was destroyed by fire on the 7th of February last year. At that time the building was occupied by Mr Frank Emery's Bath pantomime company, and on the theatre being closed for the night on Friday, February 6th, there was no suspicion of any danger. About four o'clock in the morning the popular little house was discovered in flames, and in a short time was burnt to the ground, the whole of the property being destroyed. Various sites have been offered, and carefully examined by Mr C. J. Phipps, F.S.A., who has made the building of theatres a special study, and erected more than forty in London, and various parts of the United Kingdom. He is strongly in favour of that at the junction of New North-road and Longbrook-street. It appears that, having examined various sites, Mr Phipps was of opinion that none offered the advantages of the plot of land at the angle of the New North-road and Longbrook street; standing as it did in two streets affording admirable facility for access and egres. On this recommendation the site was selected. The plans show that the principal approach will be at the angle of the building, facing the High-street, and the entrance would lead through a spacious foyer to the level of the dress circle. The pit and upper circle will be entered from Longbrook-street, and the gallery from New North-road. One feature of the plan is that both the pit and upper floors of the theatre have each two distinct means of separate egress on opposite sides of the building. The slope of Longbrook-street enables the entrance to the stage, and the stage itself, to be on the street level. In addition to the theatre, Mr Phipps arranged for six shops in Longbrook-street. Over these will be the dressing-rooms of the theatre, all conveniently arranged, and fitted with every proper appliance. The above text in quotes was edited from an article first published in the ERA, 15th of May 1886. Four months after the foundation stone for the new Theatre Royal was laid the Era printed a report on the fact that the Theatre was nearing completion in their 25th of September 1886 edition saying: 'Exonians see with much pleasure the speedy completion of the handsome new playhouse for the city which it is now arranged shall be opened about October 14th. The new structure is a vast improvement on the old and popular home of the drama in Exeter that stood in Bedford-circus, and which, it will be remembered, was destroyed by fire during the pantomime season in February, 1885. The new building is the fourth theatre that has been erected in the city, and will undoubtedly be a handsome addition to the architecture of the place, standing as it does in the commanding and convenient position of the London Inn-squaredirectly in the centre of the city. Very soon after the destruction of the old building it was felt that the city had experienced a serious loss, and that the numerous playgoers felt a void which ought not long to exist. Amongst some of the leading citizens a company was projected to meet the requirements of the community by providing a new theatre, the capital of the company being £10,000 in 1,000 shares of £10 each. Mr C. J. Phipps, F.S.A., was called into counsel, and, as various sites had been offered for the purpose, they were submitted to his consideration, and he decided at once in favour of the Longbrook site, and as this also found favour with the directors, it was purchased of Mr W. R. Cummings for £3,000. The designs having been approved, tenders were invited for the erection of the theatre with six shops underneath facing on Longbrook-street, the whole forming part of one block. The tender of Mr Bevan in the sum of £5,500 was accepted, and in December of last year he took possession of the site and the structures upon it. At that time the ground was covered with stabling and stores. The whole of these had to be pulled down, and then some 4,000 yards of earth had to be excavated in order to give the necessary accommodation underground. The result was that some considerable time elapsed before the actual work of erecting the building commenced. Since its commencement, however, the work has been pushed along rapidly, and is now so far forward that in a very short time the theatre will be ready for the internal fittings and decoration. The building throughout is of a most substantial character, and appears to be fitted up in a manner most convenient both for the audience and for the performers. Great attention has been paid to the ventilation, and special care has been taken to insure speedy means of exit in case of accident. In front of the principal entrance is an ornamental portico, and from this double doors open into a vestibule, beyond which is the dress-circle foyer, 16ft. wide by 29ft. long. On the right is the pay-office, and on the left a cloak-room, and a staircase leading to a spacious saloon at the back of the upper circle. The dress circle, which is a little above the level of the stage, contains seven rows of seats, and will afford accommodation for 166 persons. There are four private boxes, two on a level with the dress circle and two entered from the pit. The upper circle entrance is from Longbrook-street, a few feet from the portico. It is approached by means of a fire-proof staircase. It contains four tiers of seats, and affords accommodation for 150 persons. At the rear and above the upper circle is the gallery, which contains ten rows of seats. The gallery slopes upwards and backwards, and will accommodate about 550 persons. Special regard has been paid to the ventilation of the gallery, which in every respect will be vastly superior to the gallery in the old theatre. It is approached by a side entrance in the New North-road. The pit will accommodate 650 and is entered from Longbrook-street. It is provided with three means of exit, so that in case of emergency it could be cleared very rapidly. The above text in quotes was first published in the ERA, 25th of September 1886. The new Theatre Royal finally opened with a production of 'The Breach of Promise.' 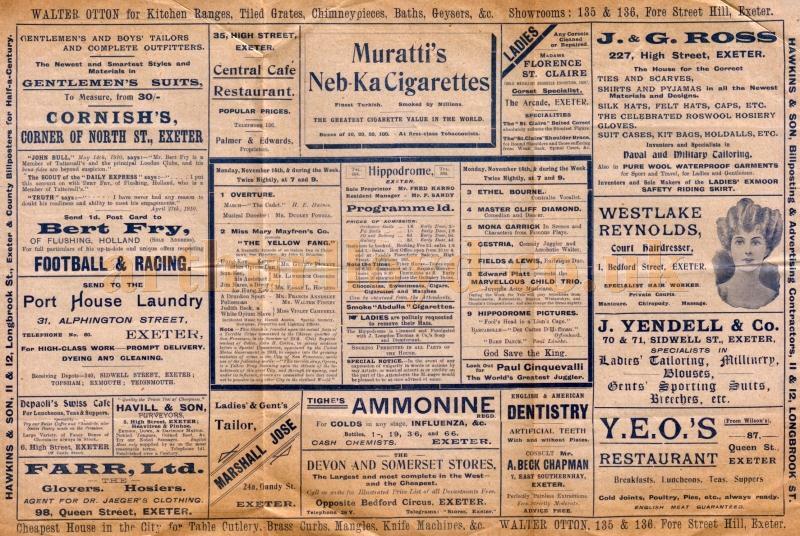 on the 13th of October 1886, some five months after the foundation stone was laid on the 12th of May. The ERA reported the opening of the Theatre in their 16th of October edition saying: 'The new Theatre Royal, Exeter, a description of which has already appeared in the columns of The Era, was opened under the most favourable circumstance on Wednesday evening... The event has been looked forward to with much interest, not only in the city, but also throughout that portion of the county of which Exeter stands as the centre, the result being that the new playhouse presented a crowded and animated spectacle on Wednesday evening. As to the interior of the new theatre, it should be stated that the rich and splendid appointments, the modern style, the ample provision, and the artistic treatment within and without, stamp the new building as quite a triumph in its way. In the general construction of the interior the comfort of the public has been studied, particularly as to a good view of the stage being obtained from every part of the house. In the stalls the seats are all covered with rich crimson, and they gradually ascend until the back row is nearly level with the stage. Each seat in the dress circle is separate, and can be closed up when not in use. The upper circle is in part a continuation of the gallery, but on a much lower level; and another special feature of the interior is in the gallery being so placed that those in the pit cannot be seen by persons in the higher region. The foyer is decorated in painting with a combination of colours, and, besides being the locality of the booking-office, will provide room for those who have to wait for their carriages at the close of the performance. Connected with all parts of the house are saloons for gentlemen, and also for ladies. The above text in quotes was edited from an article first published in the ERA, 16th of October 1886. 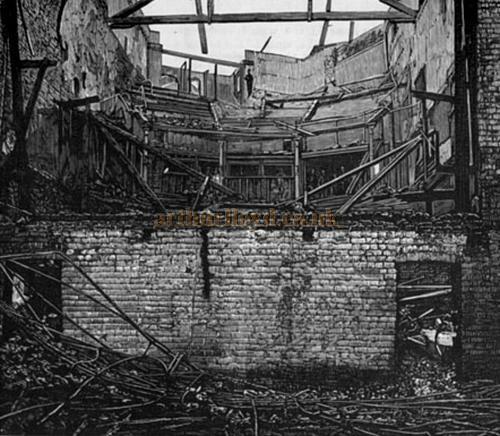 Right - A Photograph of the interior of the Theatre Royal, Exeter after the disastrous fire on the 7th of February 1885 - From the Illustrated London News. There are many articles and images of the fire here. The Theatre was replaced by a new Theatre Royal, on the same site, in 1889. Details below. The difficulties which surrounded the enterprise at the outset were such as would have been accounted by ordinary citizens absolutely insurmountable. But certain things which at the first were of an untoward nature, so far from preventing the new venture becoming a success, as a matter of fact actually conduced to the latter consummation. At the time of the disaster the head of the company was Mr. Alderman W. Horton Ellis, than whom probably there is no more astute business man within the city's boundaries. When the time arrived for considering the question of either restoring the old building, or providing an absolutely new one, Mr. Horton Ellis took up the subject with energy; and it is only fair to that gentleman to say that the adoption of a scheme, as foreshadowed by Mr. Henry Irving, of the Lyceum Theatre, is due to his perspicuity and determination at the outset. Mr. Ellis gave deep study to the plan which Mr. Irving had conceived, and having in the end satisfied himself that the principle was a right one, he determined to use all his influence to induce the directorate to assent to that scheme in preference to any other. It may be well to mention that after the disaster occurred at the top of Longbrook-street in September, 1887, Mr. Irving set himself the task of attempting to devise a simple plan of a building which should combine facility for stage purposes, with an absolute safety to any audience. We believe that Mr. Irving, through his skilled architect (Shown Left) (of the firm of Darbyshire and Smith), has solved the problem which for so long baffled clever professional men and that Exeter Theatre will prove a model upon which buildings of a like character may safely be constructed throughout the world. The work was commenced in March last, six months being the limit of time given for the completion of the building. There was a general chorus of surprise at the small amount of time allowed, and the opinion was freely expressed that the work could not be carried out within it. However, true to his reputation, Mr. Dart has handed over the building complete according to the terms of his contract, to the entire satisfaction, not only of the directors, but every member of the proprietrate. It goes without saying that it would have been a much easier task for the builder to have constructed an entirely new theatre than adapt the carcase of the old one. The difficulties have been great and vexatious, and it is to the credit of all concerned that the work has been so admirably executed. Mr. Dart, senr is not daunted by ordinary obstacles in building construction, and his son, Mr. W. J. Dart (in charge of the work) has been equal to the removal of each hindrance as it presented itself. Fortunately for the company, the clerk of the works, Mr. William Axon, is a gentleman possessed of distinct professional ability, a cool-headed man, who has left no stone unturned to fulfill the duties devolving upon him, in a conscientous, and at the same time, skillful manner His geniality also has made him a favourite with all the employees, even down to the humblest labourer, whilst the simplest wish expressed to him by the directors or his immediate employers has received his careful and prompt attention. The multitudinous sketches and drawings which Mr. Axon has so effectually worked out during the building of the theatre prove him to be a most competent draughteman, and we shall be pleased to hear of his success in the construction of other "Temples" such as that which is now an ornament to the "ever faithful." The main principles of the Irving Safety Theatre have already been explained in these columns, but it will do no harm to repeat them. There was an outcry originally against the utilisation of the present site, but even the strongest opponents of that scheme have,we believe, now come to the conclusion that after all it would have been little short of folly to have given way to what was a kind of squeamish sentiment. It has now become the express determination of the authorities in many large cities of the kingdom not to license any theatres in the future which do not stand, so to speak, in their own grounds, and if that determination had been departed from by the local County Council the provision of a theatre for Exeter would probably have been very considerably delayed. The complete isolation of the edifice from surrounding property was almost imperative, and there can be no doubt that the directors would have been put to great straits to find a site in a central position in the city so well adapted for the purpose as the one which has been utilised. Another principle of great value is the separation of the different divisions of the theatre so that their isolation could be completed at a moment's notice. The stage, auditorium, and the artists' section are so admirably divided as to absolutely prevent confusion if ever the emergency should arise in which the occupants of the building wore desirous of beating a hasty retreat. Thirdly, each portion of the house is provided with an exit and entrance, thus making all the exits communicate with the main thoroughfares, and absolutely cut off from every other portion of the building. But the grandest principle of all is the arrangement which obviates the provision of tiers which obtained in the old system. The gallery no longer exists, and the upper circle is likewise done away with, so that the audience is placed on two different levels only. The "horse-shoe"which, by the way, we hope may be a lucky onewill give seating accommodation in its first three rows of seats to the "dress" circle, while the remainder are appropriated to the patrons in ordinary dress. The lower level provides for orchestra stalls, pit, and in the rear of all, beneath the circle, the amphitheatre, or 6d. seats. This latter arrangement is arrived at by placing a portion of the theatre below the ground level, and increasing the size of the auditorium. In this way, although it may seem almost incredible, the highest point reached by the audience is not more than 8ft from the ground. In the old building, unhappily, the proscenium wall was not carried through to the roof. This has been obviated, and in the proscenium wall, which now runs right through to the foundations and to the roof, there is no opening but that for the stage, and this can be blocked by a Titancrete curtain which is brought down from the roof, and closes hermetically on the wall beneath in twenty seconds. Those who remember the disaster in 1887 well know that many people who lost their liven were asphyxiated before the flames reached them. Such an effect even under the fiercest fire could never recur in the present theatre. Should a conflagration take place on the stage, the smoke is bound to ascend to a large funnel in the roofwhich latter, by the way, is constructed of concrete. In order to make assurance doubly, and, trebly sure, so to speak, every staircase is fireproof; the floors of the pit and circle are of Titancrete; the stairs are of concrete, and all places where the audience, or any occupants of the theatre have to place their feat, in snaking their way out of the building, are absolutely unburnable. It will thus be seen that none of the materials associated in the old building are present in the new, and every element of danger which presented itself in the old building is positively excluded in the structure as it now stands. The interior of the auditorium is elegant in the extreme, and when, to use a homely phrase, the Directors' "ship" arrives in port, and the complete decoration of the building is effected, Exeter Theatre will be second to none in Europe. By dint of energetic action the Electric Light Company have been enabled to fulfill their contract, the fact being in a great measure due to the kindness of Mr. Robert Pople, who permitted a portable engine to be placed in his yard. The effect of the new illuminant in the building is brilliant in the extreme, and there is no flickering of the light whatever. The seating contracts have been admirably executed, and all praise is due to those gentlemen who were selected for the work. Mr. C. E. Baker, of Fore-street, who has of late been resorted to for many important contracts in the city, has seated the principal portion of the grand circle, and some other parts of the house; and his work has not only satisfied the Directors but has excited the admiration of all who have taken the opportunity to look at the interior of the building. Messrs. Cavanagh, of Manchester, have supplied the orchestra stalls; and Mr. Dart, of Crediton, the pit and amphitheatre seats, and Messrs. Mark Rowe and Sons have also put in some truly excellent upholstery. They supplied the lovely crimson Wilton carpet at the main entrance; the hangings in the private boxes; the heavy cloth door curtains, the handsome saddle-bag lounges in the buffet; and the Cork carpet in the entrance lobby, dressing-rooms, green room, &c. All these were unanimously voted "good goods." It should be mentioned, also, that some of the iron work necessary for the building was supplied by Messrs. Shepherd and Son, and Messrs. Newcombe and Co.; Mr. Damerell furnished some of the brass work; and Mr. Edwin Alger carried out the interior decoration. The speaking tubes and like appliances were supplied by the well-known firm of Willey and Co. It is needless to say that in each case the work has been efficiently performed. Externally the elevation has been considerably altered and very few who were intimately acquainted with the old theatre would be able to recognise in the present elegant structure any part of that which was constructed under the superintendence of Phipps. A handsome escape portico has been added and, by the bye, we ought to state that it is ornamented by some fine shrubs, the gift of Mr. Sclater, of the Alexandra Nursery. Referring to means of escape, we may mention, as shewing the careful study which has been given by the architect to the provision of an abundance of exits, that no fewer than eight outlets are available in case of emergency from the circle alone, and attached to each door is, one of Kay's patent Locks, which prevents ingress; but permits egress on slight pressure. The building can seat 900 persons comfortably, and another 400 or 500 persons can, if neccessary, be taken in. The auditorium is 82ft. in length and 44ft. wide, and the height from the pit floor-to the spring of the large dome is only 38ft. With regard to the safety of those employed on the stage, it may be mentioned that every provision has been made for an easy withdrawal of any employee, as well as the actors end actresses, and, as a matter of fact, although the stage may be susceptible of ignition, by a judicious arrangement of fire extinguishing appliances, and by the provision of safety doors which work automatically this disaster need never happen. 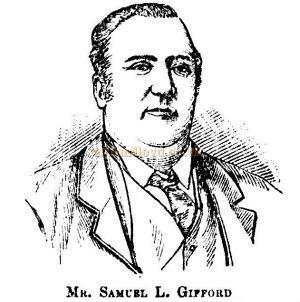 It should also be noted that the popular, manager, Mr. S. , L. Gifford, has made arrangements with every male employee, engaged in or about the theatre, to submit to a regular course of drill, so as to make him acquainted with fire extinction duties: We ought not to omit to mention that the light is supplied by the Electric Light Company, and the fittings by Messrs. Verity, the well-known electricians, of King- street, Covent Garden. It has been mentioned Already in these columns that the act-drop is a magnificent picture, the work of Mr. Widgery, senr., of Exeter, and represents a bit of the Tavy. There is also in the vestibule another picture by the same artist, and, facing it on the other side, one by Mr. Frederick Widgery. Both are splendid efforts, and fully sustain the reputation of these well-known and popular artists. We cannot help thinking, however, that the pictures are badly placed as regards light. Throughout the period during which the building has been in course of construction, the members of the directorate have worked most assiduously in conjunction with the architect and builder, in order to bring the undertaking to a successful issue. Praise is particularly duo to Mr. E. J. Domville, the Chairman, (Shown Right) for the incessant labours we have indicated. Mr. John H. Stanbury also has shown alike assiduity, and his assistance in raising the necessary additional capital has brought him the best thanks, not only of his co-directors, but of all shareholders, and the public generally. 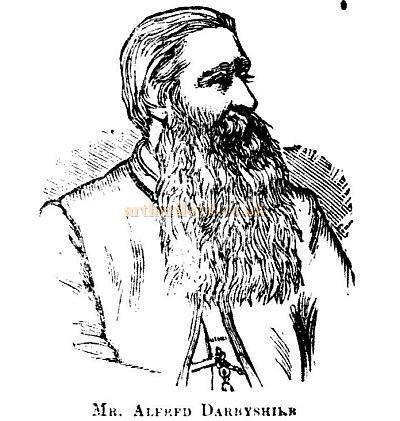 Mr. Alderman Jones, Mr. Boundy, and Mr. W. C. Richards, each in their various ways, have laboured with heartiness, and Dr. Deas, although prevented by various circumstances from attendance at all the meetings of the directorate, has, nevertheless, lent valuable counsel and assistance. A judicious selection was made by the directors in placing Mr. Samuel L. Gifford (Shown Left) (for many years associated with Mr. Neebe at the old theatre) at the head of affairs in connection with the management, and he has an able coadjutor in Mr. Frederick Pollard, who has been for some years the secretary of the Company. Mr. James Sidney, the scenic artist, has given substantial proof of "the wisdom of his appointment by some capitally executed stage scenery, admiration of which has been freely expressed by good judges, and indeed by all who have had an opportunity of inspecting the the theatre and its fittings. A word should be said for Mr. Cawdery, stage constructor and carpenter, whose work is of the very best, and has met with the approval of the directors without exception. Mr. James as chef d' orchestre will show himself essentially the right man in the right place, and the members who comprise his orchestra cannot fail to enhance the reputation which he has for so long enjoyed. Last evening will long he remembered in Exeter, especially by those who are interested in the Drama, and, simultaneously are anxious that visitors to the city should once again be able to find amusement and pleasant entertainment. The opening proceedings were a distinct triumph, and reflected credit all along the line. Morose individuals and croakers of the "Jasher" type predicted that something would occur, as a kind of confirmation of the morbid view they had all along taken of the situation. Happily, however, it is our pleasure to record that the entire ceremony - if one may call it so - passed off with unqualified success. It was said a few days ago, when the exterior of the theatre was approaching completion, that the directors were not yet "out of the wood," inasmuch as they had to test the building for sound, with an audience seated in the house, end even experts in architectural matters predicted that in this respect, the design would prove a failure. It is satisfactory to be able after last night's performance to chronicle the fact that so far from being a failure the acoustics of the Theatre Royal at the top of Longbrook-street, are equal, if not superior, to any building of the kind extant. In fact we may sum up our notice of the work accomplished by saying that from the architect to the clerk of the works, and from the builder to those who have had the fitting up of the stage and various divisions of the theatre the work is a triumphant victory for the scheme so happily inaugurated last night. Mr. Darbyshire well deserved the hearty reception he met with, and Mr. Dart, the builder, has enhanced a good name as a builder which he has for so long enjoyed. Not even the most sanguine amongst the gentlemen more immediately connected with the directorate and proprietrate, expected that the entertainment would go off so entirely free from anything like Chiok and that everything went smoothly, shows that the organisation by the management was efficient in the highest degree. We can only express the earnest hope, now that the building has become un fait accompli, that Exonians will support the institution, and that the Theatre Royal may for years and years to come enjoy financial prosperity, and thus in some measure recoup those loyal citizens who have come forward with the necessary funds to re-instate it. We sincerely trust that the performance given lest evening may be a happy augury of the future success of the drama in good old "Semper." Seldom has a more brilliant gathering been witnessed in the city than that which assembled in the theatre last evening. There was not a seat unoccupied, and several had to be content with standing room. The scene in the circle, filled with ladies and gentlemen in evening dress was exceedingly bright and gay. One and all were enthusiastic in their praise of the building. Amongst the audience were many of the leading citizens and public officials, as well as several visitors from Exmouth and other places in the neighbourhood of Exeter; Colonel Fremantle, and other leading citizens of society, who witnessed the last performance in the old building, were in evidence last night, testifying in the most practical manner to their sympathy with the work which has now been so auspiciously completed. In arranging for the production of the "Yeomen of the Guard," Gilbert and Sullivan's latest comic opera, as the opening piece, the directors made a wise selection, and no sooner was the announcement made that Mr. D'Oyly Carte's Company would appear on the first night than the success of the inaugural ceremony was assured. At the conclusion of the performance Mr. Darbyshire again came forward and read a telegram from Mr. Henry Irving, of the Lyceum, congratulating him (Mr. Darbyshire) on the completion of the work, and regretting his inability to be present, and announcing his intention of playing in the theatre at some future date. The reading of the telegram was much applauded. 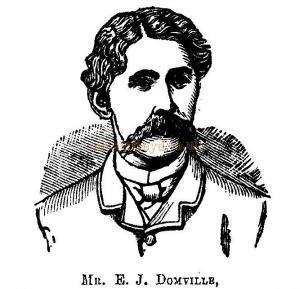 After this there were again loud calls for Dr. Domville, but it was some time before the audience were gratified. On the Chairman appearing in front of his box he was loudly cheered. Others who came in for first night honours were Mr. Bram Stoker, who was present on behalf of Mr. Henry Irving, and Mr. Boyd, the representative of the Titancrete Company. It was eleven o'clock before the proceedings terminated. The house is lighted by electricity in a most effective manner, all the latest improvements having been provided. The current, which is supplied from the Exeter Electric Light Works, is under complete control from the prompt side of the stage. This is effected by a group of switches mounted on a handsome slab of polished slate. From these switches, thirty in number, separate circuits run, so that by this means any part of the house can be lighted or not at will, and the lights raised or lowered in a rapid and certain manner. The lighting of the stage is carried out by means of the usual Sort proscenium batten and side lights, the total number of the lights being 350 of sixteen candle power each. The auditorium is to be lighted from a powerful fifty light electrolier suspended from the centre of the dome, and a number of prettily designed two light copper and brass brackets round the wall of the dress circle. The saloons are lighted by three and five light pendants, which are in some cases brass and in others iron. This brings the total number of lamps to 510. The above text is an edited transcription of an article first published in Trewman's Post , 8th of October 1889. This, the third Theatre Royal in Exeter, had a long and successful career, staging everything from Music Hall, Drama, and Ballet to Pantomime, which it became famous for staging every Christmas throughout the twentieth century. However, like so many Theatres around the Country, by the 1950's the Theatre was converted for use as a Cinema and by 1962 it had closed down completely. The Theatre was demolished the same year, 1962, and an office building was constructed on the site. 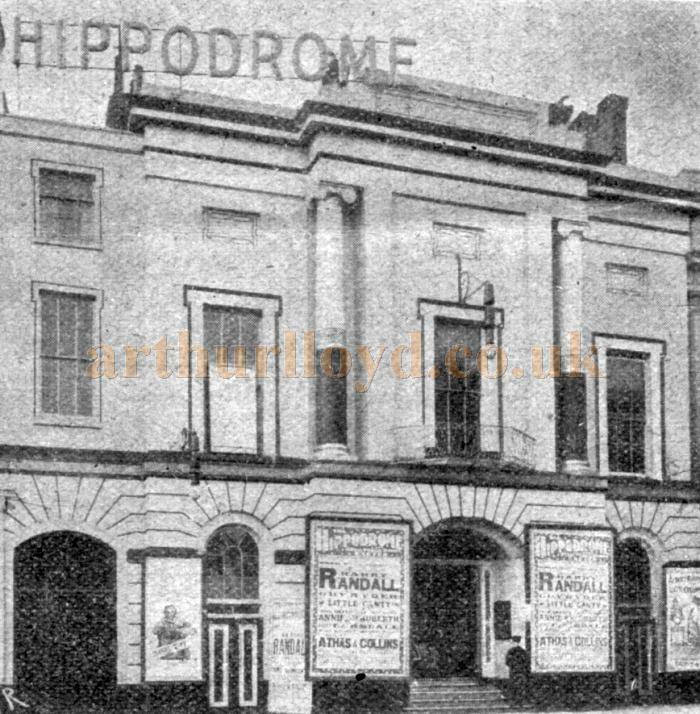 The Hippodrome Theatre, Exeter was constructed in 1908 as a conversion by Kendall from a former Public Rooms which had itself been built in 1820. It was situated opposite the later Savoy Cinema. Right - An early Programme for the Hippodrome, Exeter whilst under the management of Frederick Sandy. On the Bill were Miss Mary Mayfren's Company in 'The Yellow Fang', Ethel Bourne, Master Cliff Diamond, Mona Garrick, Cestria, Fields & Lewis, Edward Platt, and the Hippodrome Pictures. 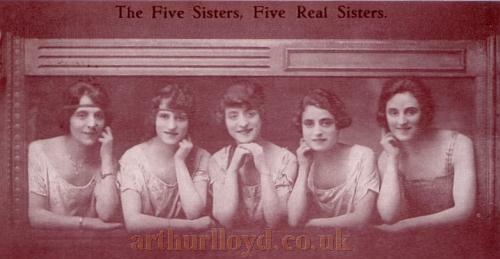 - The Programme is part of a collection of material from Ethel Bourne and Mona Garrick who were solo performers but also performed as part of their family act 'The Five Sisters', see card below. The Hippodrome Theatre was converted for Cinema use by Lucas and Langford in 1931 and renamed the Plaza Cinema. Sadly the building was bombed during the Second World War in 1942 and was subsequently demolished. Above - An early Programme for the Hippodrome, Exeter whilst under the management of Frederick Sandy. On the Bill were Miss Mary Mayfren's Company in 'The Yellow Fang', Ethel Bourne, Master Cliff Diamond, Mona Garrick, Cestria, Fields & Lewis, Edward Platt, and the Hippodrome Pictures. - The Programme is part of a collection of material from Ethel Bourne and Mona Garrick who were solo performers but also performed as part of their family act 'The Five Sisters', see card above. The Northcott Theatre came about after a failed attempt in 1962 by G. V. Northcott to save the then threatened Theatre Royal so that it could be revived as a Theatre and 'Arts Centre' for the City. The University of Exeter were also involved and worked towards a scheme along the lines of Northcott's proposals for the building which was scheduled for demolition. Sadly all of these proposals were rejected by the owners of the Theatre Royal which was then sold and demolished. However, Northcott's idea for a Theatre and Arts Centre were never completely laid to rest and the University eventually proposed a site on their Campus for the building of a new Theatre. A Trust was then set up by Northcott who put in the sum of £100,000 of his own money which was later added to by the Calouste Gulbenkian Foundation and many other sources. 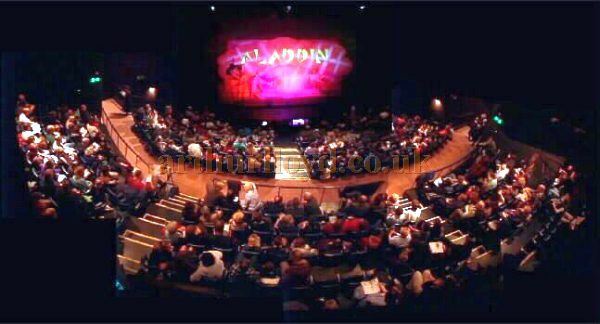 Right - The auditorium of the Northcott Theatre during the production of 'Aladdin' in December 2009 - Courtesy Jon Primrose. Five years later Exeter was the proud owner of a brand new Theatre, the Northcott Theatre, which was designed by Sir William Holford and Partners and opened under the direction of Tony Church, with a production of 'The Merchant of Venice' on the 2nd of November 1967. The Northcott Theatre has a semicircular auditorium now capable of seating 468 people since its major refurbishment in 2007, and was, and still is, a producing house which stages its own productions in repertory, although there are the occasional visits from wider afield and productions staged in collaboration with other repertory companies around the Country. If you have any images for this Theatre that you are willing to share please Contact me. The Barnfield Theatre was originally built in the late 1800s for the Exeter Literary Society, opening as the Barnfield Hall. The Hall was converted into a Theatre in 1972 and is now run by Barnfield Theatre Ltd., as a place for local amateur groups such as the Exeter Little Theatre Company, and professional companies, to stage their varied productions. The Theatre is equipped with a raked auditorium with seating for 289 people. A smaller Studio Theatre and conference room, now called the Clifford Room, is also included in the building, the whole of which was refurbished at a cost of £200,000 in 2007. The Bike Shed Theatre is a conversion from a former restaurant at the top of Fore Street, Exeter. The Theatre opened in February 2010 as a home for the Particular Theatre Company whose production of 'The Distance,' opened there on Monday, February 8th 2010. After the success of this production a trial lease was agreed and the Theatre now has a full program of events through to the end of June with its resident company, Particular Theatre, producing two runs of new plays in April and June. The Bike Shed Theatre was awarded 'Most Welcoming Theatre' in the UK Theatre Awards in 2013. The Palladium Theatre, Exeter was originally built as the Queen's Hall in 1912. The Theatre was demolished after 1921. The Savoy Theatre, Exeter was built in 1936 by W. R. Glen. The Theatre was demolished in 1987. The Victoria Hall, Exeter was built as a Public Hall in 1873. The Hall was converted into a Circus in 1885. In 1910 the building was converted for use as a Cine-Variety house. The building was destroyed by fire in 1919 and subsequently demolished.